Bahati Salomon wants to go back to the militia. I wrote this article shortly after I returned from the Congo. It received second place in the Red Cross International Humanitarian Law student journalism competition. Bahati Salomon shifts in his chair after he says this, his small hands drumming the wooden table top.His blue overalls, meant for a grown man, sag past his slender shoulders and gather in soft bunches around his ankles. Bahati is 12 years old. Weâ€™re sitting in a bare office in the Centre for Children Affected by Trauma in Goma,in the Democratic Republic of Congo.The Congo has been ripped apart by a bloody war that the International Rescue Committee estimates has killed more than 5.4 million people since 1998. Battlelines have been roughly drawn between two groups. On one side stands the Congolese army, known as FARDC, who collaborate with the UN peacekeepers MONUSCO. On the other side; the thirty odd armed groups that terrorise the troubled nation. They have a various levels of wealth and members, and exist for many reasons. But one thing most armed groups, including the Congolese army itself have in common is child soldiers. 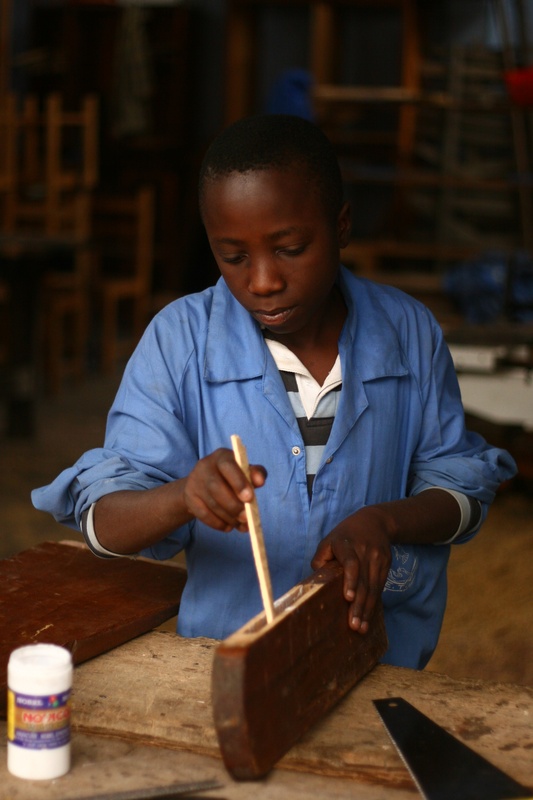 Child Soldiers International estimates one in ten child soldiers – or 30,000 children – are found in the DRC. Bahati was first recruited to a MaiMai militia when he was 10 years old. â€œI was with a friend in the field and some men came up to us with guns and said â€˜Youâ€™re not going home,â€™â€he says. Bahatiâ€™s first combat was four days later.It was his first time using a gun and his friend was killed. And in October 2012,the government of the Congo signed an Action Plan with the UN to end the use of child soldiers. But the UN Secretary Generalâ€™s annual report on children in armed conflicts says children continue to be recruited and used, sometimes systematically, in the DRC. This problem runs deep. A long history of impunity means militias recruit children without fear of consequence. But thereâ€™s another issue at hand. With lawlessness and a dysfunctional justice system, many children are happy to take up weapons in defence of their families and homes. This was the case with Bahatiâ€™s classmate Rosine Bindu Lukoo. Rosine is now 18.When she was 10 years old,the FDLR militia invaded her hometown. â€œThey attacked my grandparents with their machetes.Then they went for my brother and his wife.His wife was pregnant,so they cut open her womb to try and kill the unborn child inside,â€she says. Rosine fled with her mother to a field,where she hid in a ditch. She survived, but when the local Mai Mai militia came looking for soldiers, it didnâ€™t take much to convince Rosine to sign up. â€œI was angry,I wanted to join because the FDLR killed my family,â€she says. Rosine was not paid a wage and she had to participate in armed ambushes to steal clothes. Rosineâ€™s story also shows why militias prefer to use young recruits;they can be loyal and extremely cheap. But with poverty rife in the DRC,some see the life of a soldier as a good one. Rosine agrees.â€œWhat they have done for me at this school is good,but itâ€™s not enough,â€ she says. Recently,this has led to more top-down efforts in preventing the use of child soldiers. In 2012 the International Criminal Court sentenced the warlord Thomas Lubanga to 14 years prison for enlisting and conscripting soldiers under the age of 15. As this article goes to press, there is a warrant from the ICC to arrest Bosco Ntaganda for the same charges. But other warlords continue to wreak havoc. General Fall, who is in charge of the FARDC in the incredibly troubled Ituri region of the Congo has spent the month of August attempting to defeat a man named Cobra Matata and his militia FRBI. â€œThey claim to have 2000 armed men.In reality they have 200 or 300 proper soldiers.The rest are kids,â€says General Fall. With so many children involved,General Fall says the army and MONUSCO had little choice but to leave them be. â€œItâ€™s difficult because it will bring a lot of collateral damages. We can easily chase them from the area, but in doing so we will kill a lot of children,â€ he says. But the ICC has not yet issued a warrant for Cobra Matata, and at the national level, punishment is lacking.NGOs complain that unless the international community insists,the Congo leaves many warlords alone. â€œThe Congolese authorities have consistently failed to effectively investigate and bring to justice those suspected of recruiting and using children in hostilities,â€ says Child Soldiers International in a statement on their website. A UN task force documented 20 cases of recruitment and use of children by the FARDC in 2012, according to the Secretary Generalâ€™s report. But the policies and procedures of the UN or ICC are above the head of 12 year old Bahati.He just hopes many of the other children he fought with leave their guns behind. â€œThereâ€™s good and bad things about being in the militia,â€he says, shyly playing with his sleeve. Previous PostThe time we felt Lebanon’s bleeding heartNext PostAnd this is too hard; on life and early death in the Congo.